COLORADO SPRINGS – In Sarah Arellano’s fourth grade class, students read out loud and in unison passages from Pandora’s Box on Ancient Greek Myths. They use their pencils to track the sentences. They then split into pairs to pick their favorite Greek characters. Down the hall, Diana Abowitz’s fifth grade class is discussing human rights. Abowitz asks the class about “blood diamonds” – the gems that fuel wars and atrocities in Africa. Hands shoot up in the air eager to answer. “People in the Congo are fighting over diamonds,” fifth grader David begins his answer. And across the way, fifth grade teacher Erica Colon picks a stick out of a carton of numbered sticks and calls out “23.” A student named Ruby has the number 23, and she yells with glee. There is a sea of groans from her classmates who were not selected to answer the question from their reading text. 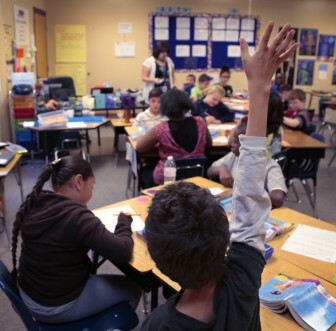 Welcome to Centennial Elementary in Colorado Springs where low proficiency rates in reading, writing and arithmetic and wide achievement gaps between races are relics of a not so distant past. Nestled among apartment buildings and sitting in the middle of one the city’s highest crime rate census tracts, the elementary school in the Harrison School District serves almost entirely low-income students with an enrollment of 575 that is 42 percent Latino, 22 percent white and 22 percent black. Four years ago, less than half of the Latino and black students were proficient in reading and barely half in math. The achievement gap with the white students was as high as 30 percentage points on the standardized tests. 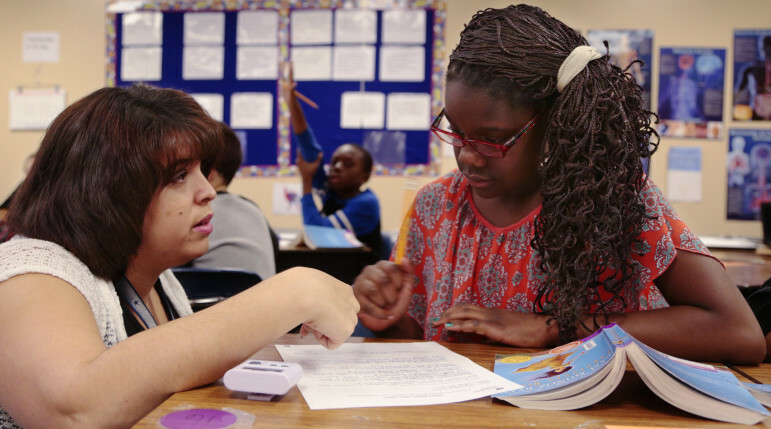 Last year, more than 75 percent of Latino, black and white students were proficient or better in both math and reading. The gap had shrunk to single digits. Principal Kim Noyes was recruited to the school five years ago as an assistant principal by then principal Wendy Birhanzel. “She (Birhanzel) was sent by the former superintendent because this was a very struggling school. He said I need somebody who is going to flip this around,” Noyes said. The new team met with teachers, parents and community leaders to set a new tone emphasizing achievement, she said. 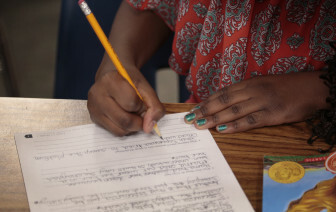 They adopted a longer school day running from 8 a.m. to 3:35 p.m. Every student is fed a free breakfast at 8 a.m. Two hours of reading and writing begin at 8:20 a.m. Lunch is also free. The school has carved out intervention periods to help students who are behind. Volunteers and the gym and art teachers are enlisted to help. The more advanced students spend the time on science experiments or technology work, Noyes said. After school, Centennial offers tutoring for students, with about 150 on average staying late, she said. They get a free dinner and are taken home by a bus if their parents can’t pick them up. “We’ve taken away the obstacles,” Noyes said. Students are released early on Monday for teacher development and discussions on student data. All teachers from each grade jointly plan the lessons. “We’re allowing our teachers to teach,” said Noyes. Five years ago, there was no parent organization, she said. Today, parents routinely volunteer in classrooms. The school now has 17 sponsors who provide school supplies, food and volunteer support, freeing up money to expand the school day and services. Fifth grade teacher Elliot Nasser, a native New Yorker, began his teaching career at Centennial. He said he moved back to New York to teach at a charter school, but missed Centennial and returned after a year. In 2014, when Centennial got back the test results showing the high proficiency levels and low gaps, the school celebrated. Staff called families one by one to tell parents their child had scored proficient in reading or math or writing or all three, Noyes said.